Cost of Asset: Actual cost of Acquisition of an Asset, after considering all the direct expenses related to acquiring of asset, borrowing cost and any directly attributable cost to bringing the asset to its present condition and location, like Freight, Insurance, and Taxes. Salvage Value: Salvage Value of asset means expected realizable value of an asset at the end of its useful life. It is also called as Residual Value. Useful Life of Asset: The Time period during which the asset can be used. After the end of useful life, the value of asset becomes zero. 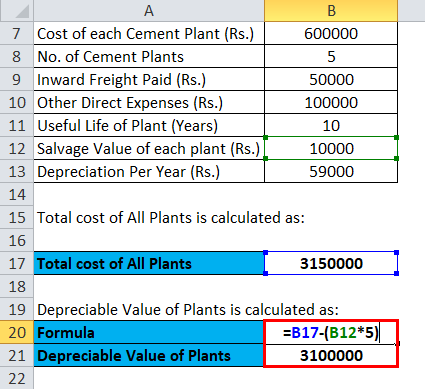 Let’s take an example to understand the calculation of Straight Line Depreciation formula. ABC Inc. purchased a boiler plant for Rs.800000. The useful life of the plant is 10 years. The plant can be sold at Rs.50000 at the end of 10 years. 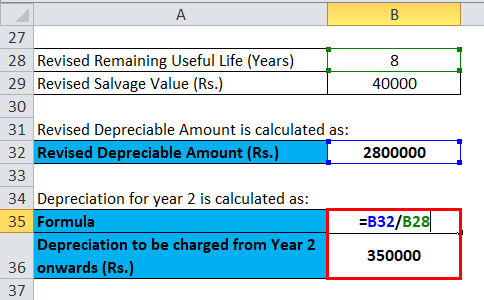 Calculate the depreciation to be charged each year using the Straight Line Method. RIL purchased an Oil Refinery machine for Rs.50 lacs on 01/04/2016. RIL is expected to use this machinery for 20 years after that Machine will be scrapped and will not have any residual value. In such a case, RIL will charge Depreciation of Rs.250000 each year, starting from the Year 2016-17 till 2035-36. At the end of 31st March 2036, the full amount of Machine will be depreciated and it will have NIL value. L&T purchased 5 Cement Plants for undertaking a capital expenditure on construction of Roads on a cost price of Rs.600000 each. It paid Rs.50000 for the freight to bring the plants to the construction site. It further incurred Rs.100000 to bring these plants to their working conditions. Plants will have a useful life of 10 years, after which they can be sold for Rs.10000 each. 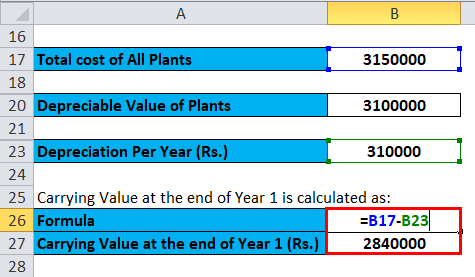 Suppose now in Year 2, Management estimates remaining useful life of plants to be 8 years and Residual Value to be Rs. 40000. 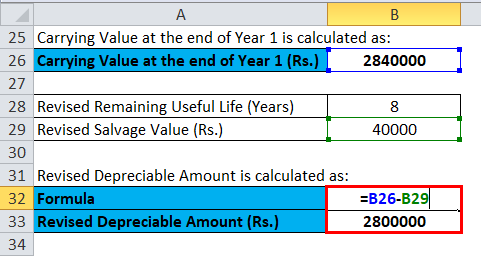 In this way we can conclude that with the revision in estimates of useful life of assets and Residual Value, Depreciation amount also get revised, keeping the amount to be charged as depreciation, constant every year. 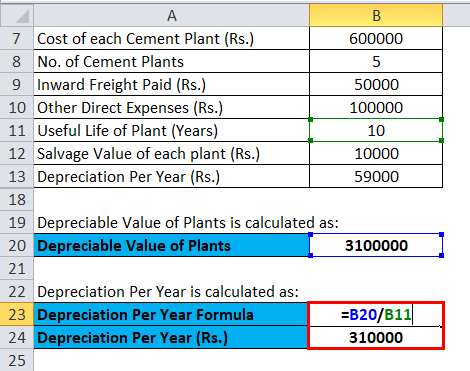 Straight Line Depreciation Formula allocates the Depreciable amount of an asset over its useful life in equal proportion. 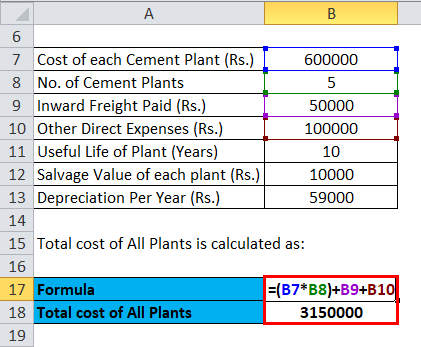 Straight Line Depreciation formula assumes that benefit from the asset will be derived evenly over its useful life. At the end of the useful life of an asset, the value of asset becomes Zero or equal to the realizable value. This method depreciates the asset in a straight downward sloping line. Salvage value or Residual value of the asset is deducted from the purchase price of the asset to assess the depreciable value of the asset. 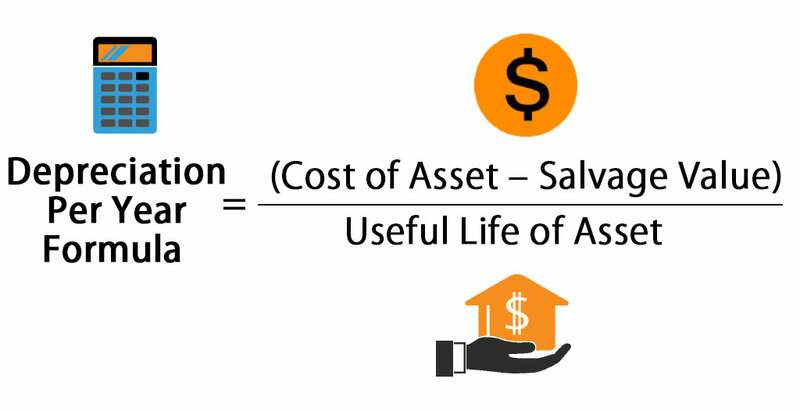 This salvage value is an estimation of an amount that will be earned when the asset is sold at the end of its useful life. Salvage value is estimated every year. If there is a change in the estimation of value, the corresponding effect is reflected in depreciable amount and so to depreciation too. Straight line depreciation is an accounting method that is most useful for getting a more realistic view of profit margins in businesses primarily using long-term assets. These types of assets include office buildings, manufacturing equipment, computers, office furniture, and vehicles. These are considered long-term assets because they will last for more than one year and are necessary to run the business on a day-to-day basis. This method evens out the profits and expenses at an equal rate, using the straight-line depreciation method. 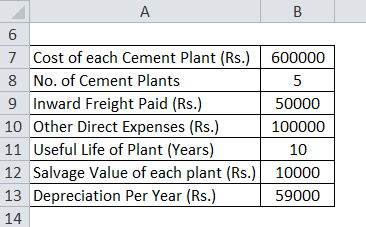 Straight Line Depreciation Method is a highly recommended method as it is the easiest method for calculating Depreciation. It is less prone to the calculation error risk as it does not involve complex calculations and data. It also does not cause variation in the Profit and Loss Statement of each year as Depreciation is provided uniformly over its useful life. You can use the following Straight Line Depreciation Calculator.